Although riding an ATV is exciting and fun, every rider needs to be aware that an all terrain vehicle is not a toy. 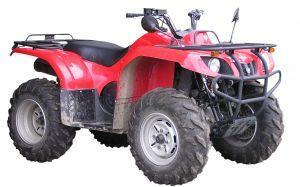 Depending on the size and model, an ATV can weigh up to 600 pounds. They are powerful machines that are capable of reaching speeds of more than 70 miles per hour. Statistics show that each year accidents involving ATV's claim hundreds of lives and injuries number in the hundreds of thousands, with young males under the age of sixteen being at the highest risk. Many ATV accidents could be prevented if the riders follow the safety rules and tips for all terrain vehicles. Although laws regarding riding all terrain vehicles differ from state to state, the following safety rules will help keep you safe regardless of where you live. Take the time to become properly trained to ride your ATV. In most areas ATV training is provided free or for a nominal fee. The hands-on training teaches ATV riders how to control their vehicle under normal and emergency situations. The courses are provided by the ATV Safety Institute, the National 4-H Council and many local ATV groups. The ATV Safety Institute also provides a free safety e-course online. Call 800-887-2887 or visit them online at the ATV Safety Institute. Always wear a properly-fitted helmet that is certified by the Snell Memorial Foundation and the United States Department of Transportation. In addition to a motorized sports helmet or a motorcycle helmet that is DOT (Department of Transportation) compliant, ATV riders should also wear a long sleeved shirt and pants, boots that are over the ankle in length, gloves and goggles. Do not drive an ATV on a paved road, except where you must cross one. All terrain vehicles are designed to be used for riding off-road and are often hard to control on paved roads. Always ride at a safe speed. Do not ride an ATV if there is poor visibility or at night. Never drive an ATV if you have been drinking or are under the influence of any type of drug. Both drugs and alcohol impair the user's judgment and reaction time. A child under the age of 16 should never drive an ATV made for adults. Children under this age do not have the developmental skills a driver needs to handle an adult all terrain vehicle. Children under the age of six should not be on an ATV at all, either as a driver or as a passenger. Follow the recommendation of the ATV's manufacturer and the Consumer Product Safety Commission regarding the model and the age of the driver. For example, Y-6 models which have engines under 70 cubic centimeters are recommended for children ages six to 11 and Y-12 models, with engines that are 70 to 90 cubic centimeters, are recommended for children that are 12 through 15 years old. Never leave a child riding an ATV unsupervised. Do not drive a passenger on an ATV. Although there are exceptions, most ATVs are designed for only one rider. When driving an ATV, the driver needs to be able to shift his weight to compensate for the terrain and riding conditions. If your ATV is designed to carry a passenger, never carry more than one person. Keep your ATV running smoothly with the proper maintenance. Three wheeled ATVs have been deemed unsafe and are no longer manufactured. Do not ride one. The ATV Safety Institute publishes an online version of their 58-page booklet, Tips and Practice Guide for the All-Terrain Vehicle Rider which every ATV rider should read. In addition to being aware of ATV safety rules and following them, it is important to always act responsibly and remember you are driving a powerful motorized vehicle.